1.) 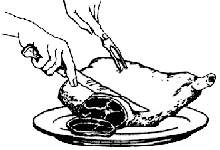 Place the roast on the platter with the shank to the carver’s right and the tip section on the near side. From this, remove two or three slices lengthwise to form a base. 2.) 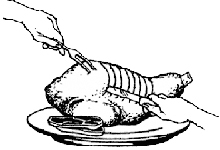 Turn the roast up on the base, and starting at the shank end, make slices perpendicular to the leg bone as shown in the illustration. 3.) 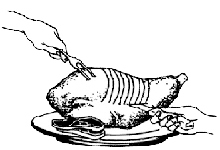 After reaching the aitchbone (rump bone), loosen the slices by cutting under them, following the top of the leg bone. Remove slices to platter and then serve.